and Five views of a creeping Honey possum (Tarisipes rostratus) ($4). Alongside these titles, we will also have editions of Paint Out ($20) and Ripples in the Open ($5) released at Sticky Institute's Festival of the Photocopier, earlier in the year. Based in Melbourne, we work from home. And more often than not, we collaborate with each other. We rather fell into collaboration, many years ago now, and it is one based on harmony. To date, we have made 99 artists’ book titles and 127 zine titles. We decided early on in our collaboration, through an organic process, not to polish the same skills. We naturally lent towards different things and now bring those different things together to make one work not possible without the other. Working this way, a third work is made that belongs to us both. The two of us have been fans of the book for a long time now, and it is perhaps because no work is ever as you’d imagined or saw in your mind’s eye, that we keep working with books. Every step, every part of the process, every learning curve, holds us entranced. 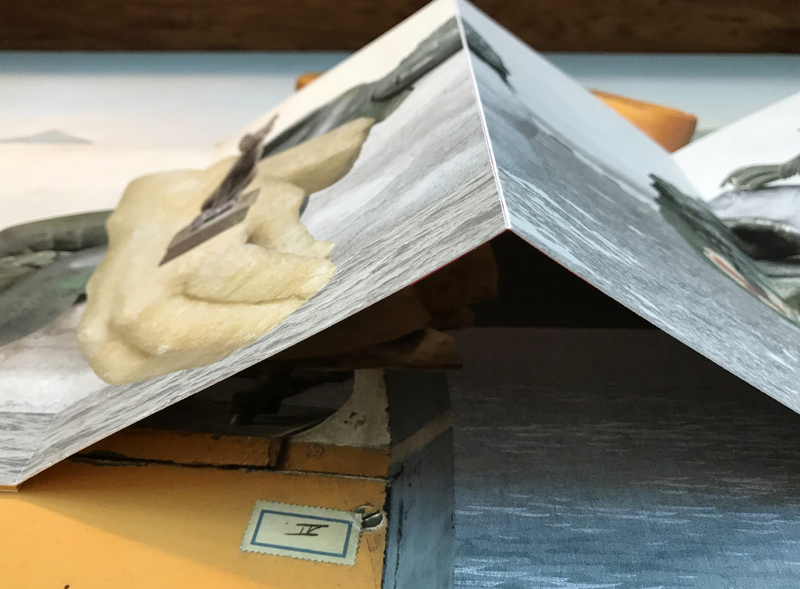 We love the challenge artists’ books present, the possibilities and history they hold, and the intimacy they can awaken in the reader. The flexible medium of the book holds us in its palm rather than us holding the book in our own palms. In the beginning, the medium of the artists' book seemed, to us, to be free of rules and regulations. It also presented many new things to consider, from page layout and sequence to typographical decisions, and such things we tossed in the air and arranged upon their landing. Working together has meant we were able to figure out the particulars through trial and error, and groundwork. You can see an exhibition of our artists’ books at Artspace Mackay until the 3rd of February, 2019. Our exhibition, Looped, loops into infinity. Hurrah! Our stone cats and a netsuke mouse have been minding their Ps and Qs since August 2017, and we are delighted that our #GraciaLouiseLooped inhabitants, like those within A warmed pebble in my hand, are staying in the dome dais indefinitely. We are elated to have a detail of our artists' book, Paw Pad Path, feature on the cover of Australian Decorative and Fine Arts Societies’ artlife magazine (volume 27, 2018), and to be included in the accompanying article, ‘Books as Art' (Margaret Barca, pp 27–32). Our artists' book, Paw Pad Path, which was selected for the 2018 Libris Awards: Australian Artists' Book Prize exhibition, was acquired by Artspace Mackay, and we are delighted. There is still time to see our artists' book, Paw Pad Path, on display as part of the 2018 Libris Awards: Australian Artists' Book Prize at Artspace Mackay. The exhibition, which opened on Saturday the 26th of May, runs until Sunday the 19th of August, 2018. Subscribe to The Blue Notebook: Journal for artists’ books, published by Wild Conversations Press, edited by Sarah Bodman, UWE, Bristol, UK, to read our invited contribution, and other tales by other folk. Inside Volume 12, No. 2 Spring – Summer 2018 (pp. 6–14), you’ll find us talking about our artists’ books within Looped, at State Library Victoria. Head to Book Arts to subscribe (hard copy and digital). The space between our understanding of the world and how a fox (in a painting) sees the world is vast, but this is what we were thinking, dreaming, scratching, sniffing, living as we worked on our most recent artists' book, Paw Pad Path (2018). It is of the earth as much as of the canvas and of history. And we are delighted that Paw Pad Path has been selected for the forthcoming 2018 Libris Awards: Australian Artists' Book Prize exhibition at Artspace Mackay. The Libris Awards is an initiative of Mackay Regional Council through Artspace Mackay. 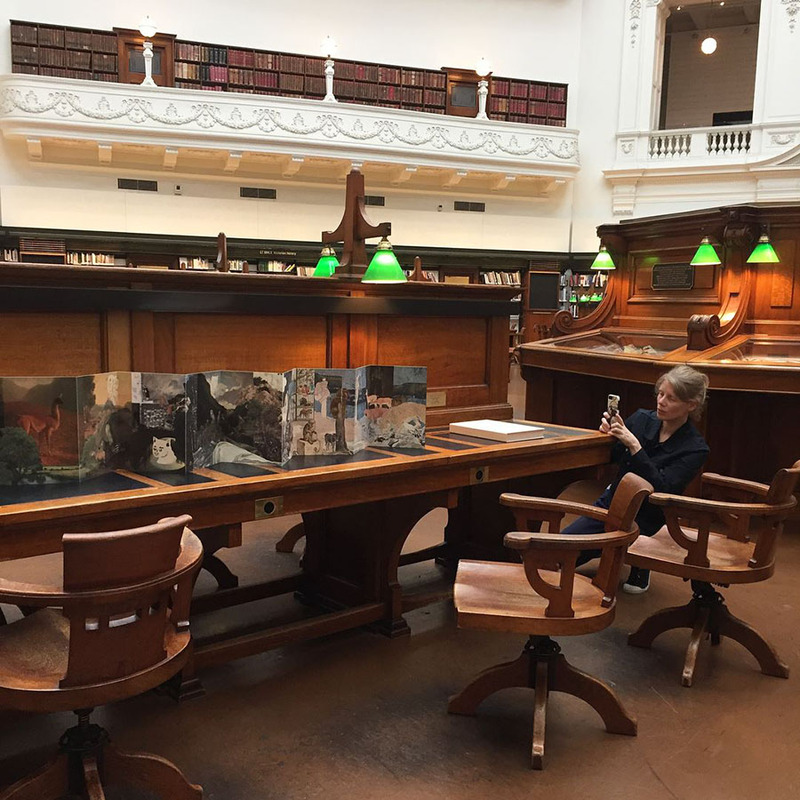 The awards seek to develop awareness of the council’s significant collection of artists' books, and to develop the collection further through the acquisition of new works by leading Australian artists working in the field. The Australian Book Designers Association recently announced the Longlist for the 66th Australian Book Design Awards 2018, and we are delighted that Prattle, scoop, trembling: a flutter of Australian birds is one of seven books longlisted in the Best Designed Independent Book category. You can pick up a copy of Prattle, scoop, trembling: a flutter of Australian birds through our online store. For a fourth year running, we are returning to the Melbourne Art Book Fair at the NGV, and with us we will be bringing scores of new artists' books, zines, and prints. Some of these new titles you may have seen unfurling on instagram, and tomorrow, should you be in the neighbourhood, you can see them with your own eyes, leaf through them with your own fingers, nestle them in your own palm. And we’re set to do it all again, for a fourth year running. Reposted from @ngvmelbourne: “#MelbourneArtBookFair 2018 brings together the most creative emerging and established international and local publishers, artists and writers for a program of ideas, discussions and book launches. 16–18 March at NGV International." Our exhibition, A Whisker of Light, is open! Until the 29th of April, 2018, head to Maitland Regional Art Gallery to see our artists' books, collages, and drawings. And as we're far away, we'd love to see your #AWhiskerofLight images.